There’s a reason eight-in-10 homeowners prefer the look of SunPower home solar systems over conventional options. From fewer visible parts, to low-profile racking and sleek-looking panels that complement your roof, we’ve incorporated high design into our solar solutions so you can live more sustainably without sacrificing curb appeal. In celebration of homes that are as gorgeous as they are green, we’ll be occasionally posting stories about beautiful SunPower solar projects on our blog. Solar Dealer: Active Solar, Inc. This stunning vacation home on Catalina Island off the California coast boasts 48 SunPower panels that supply 100 percent of the residence's electricity, powering a high-tech dream home that includes a state-of-the-art Lutron lighting system and a built-in electronics room. The homeowners are in the aerospace industry, so they value the latest and best technologies available and wanted to incorporate cutting-edge sustainability practices. Chris James, president of Active Solar, Inc., was chosen for his experience in working with a standing seam roof, which can be challenging for solar installers. The roof manufacturer knew James had that expertise, so referred him for the job. And there was no question for James that SunPower panels were the right choice for this home. “SunPower just makes the best panel with the best warranty. Their warranty doesn’t have a marine warranty restriction like everyone else’s does, so that makes a huge difference for an island home like this. 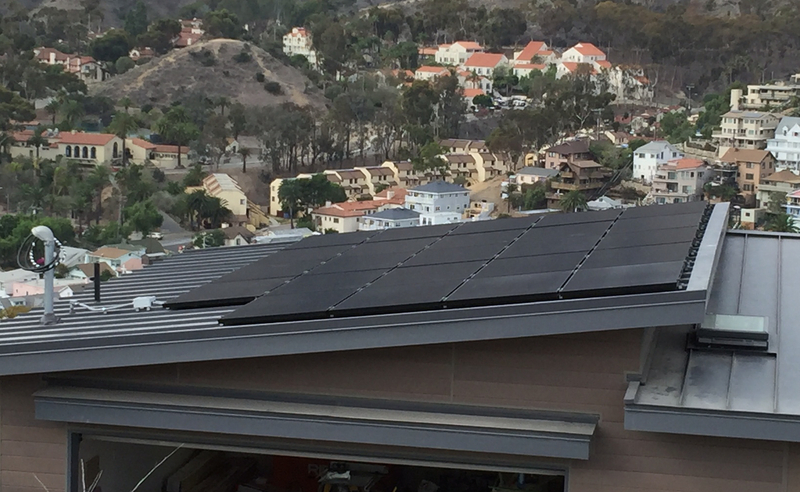 Add to that the modern aesthetics of SunPower panels and InvisiMount® hardware’s adaptability to different kinds of roof materials, and there’s no contest,” James says. James explains that with new construction and exceptional high-tech needs like this homeowner’s, it can be difficult to predict a home’s power loads. Two panels would be needed just to keep the electronics room cool, for example. So they planned a large solar system with that in mind. Recently, the homeowners were thrilled to receive a credit on their electricity bill. Homeowner Gary Johnson says he loves that his solar system is generating so much energy and appreciates how low-key and unobtrusive the SunPower panels look on the roof. “As a result of our experience with Active Solar and SunPower, we are going to look at putting (solar) on our company buildings and on our primary home in Rolling Hills, “Johnson says. 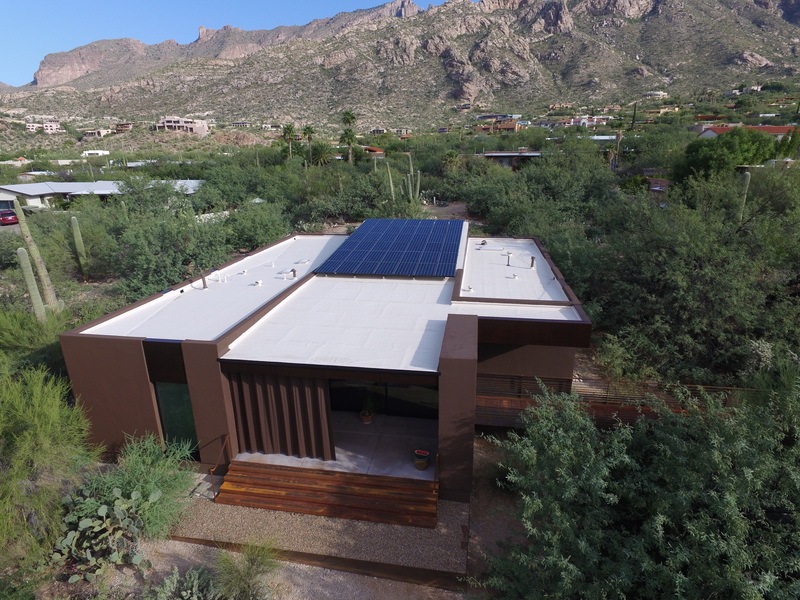 Architect Teresa Rosano of Ibarra Rosano Design Architects designed an innovative modern home for homeowners in Tucson, Arizona, who wanted not just an efficient and eco-friendly home, but a view of a mountain and desert scenery. “We optimized the slope and size of the roof for solar while preserving the ideal angle for a stunning view of the mountain. We wanted to keep the solar panels flush to the roof so they were low-profile and minimally seen while producing enough power for the homeowners’ needs,” Rosano says. Rosano chose Technicians for Sustainability to help select solar technology that would be right for the home’s environment and design and that would meet the homeowners’ electricity needs. Kevin Koch, owner of Technicians for Sustainability, chose SunPower for its superior solar technology, strong warranty and its ability to provide a sleek, low-profile, tight-fitting system that could be installed flush with the roof and look fully integrated with the home’s overall design. The tilted part of the roof holds 42 245-watt SunPower panels for a total system size of 10.3 kilowatts. Because SunPower’s highly efficient panels take up less roof space, there is room to expand the system easily if the homeowners’ decide they want to power an electric vehicle or install electric water features. In fact, Rosano designed extra conduits into the walls to give the homeowners flexibility without sacrificing form or function. In addition to solar, this lovely modern desert home has many other passive and active energy-efficient and environmentally friendly features. The home’s orientation minimizes its east/west exposure and maximizes north/south exposure. The largest windows face north for a spectacular mountain view while a large overhang protects the southern exposure to control heat. Rosano also thoughtfully incorporated cross-ventilation, maximum insulation and insulated windows to help make the home more energy efficient. “We’re seeing more and more homeowners seeking sustainable designs that include solar, rainwater harvesting, plumbing for grey water and so on. Sustainability has always been an emphasis in our firm’s work, so we’re thrilled when we get to work on homes like this one,” explains Rosano. Koch agrees, noting that it’s a privilege to have a relationship with the architect from the outset of design. Did you design or remodel the green home of your dreams with SunPower solar? Tell us about it! 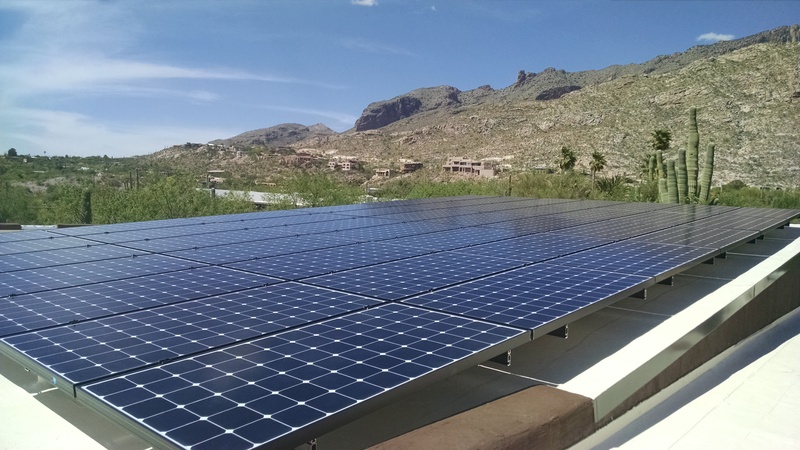 Post your solar story on our customer community page with "Solar is Beautiful," in the title and we might feature it in a future blog post. If you’re interested in going solar, try our solar calculator to see how much you can save.